In baseball, a setup man (or set-up man, also sometimes referred to as a setup pitcher or setup reliever) is a relief pitcher who regularly pitches before the closer. They commonly pitch the eighth inning, with the closer pitching the ninth. As closers were reduced to one-inning specialists, setup men became more prominent. Setup pitchers often come into the game with the team losing or the game tied. They are usually the second best relief pitcher on a team, behind the closer. After closers became one-inning pitchers, primarily in the ninth inning, setup pitchers became more highly valued. A pitcher who succeeds in this role is often promoted to a closer. Setup men are paid less than closers and mostly make less than the average Major League salary. The most common statistic used to evaluate relievers is the save. Due to the definition of the statistic, setup men are rarely in position to record a save even if they pitch well, but they can be charged with a blown save if they pitch poorly. The hold statistic was developed to help acknowledge a setup man's effectiveness, but it is not an official Major League Baseball (MLB) statistic. Historically, setup men were rarely selected to MLB All-Star Games, with the nod usually going to closers with large save totals. From 1971 through 2000, only six relievers with fewer than five saves at midseason were selected as All-Stars. There were 10 such players from 2001 through 2009. In 2015, the majority of the American League's All-Star relievers were not closers, outnumbered 4–3. Setup men who have been named All-Stars multiple times include Justin Duchscherer, Tyler Clippard, Dellin Betances, and Andrew Miller. Francisco Rodriguez, who was a setup pitcher for the Anaheim Angels in 2002, tied starting pitcher Randy Johnson's Major League Baseball record for wins in a single postseason after recording his fifth victory in the 2002 World Series. Tim McCarver wrote that the New York Yankees in 1996 "revolutionized baseball" with Mariano Rivera, "a middle reliever who should have been on the All-Star team and who was a legitimate MVP candidate." 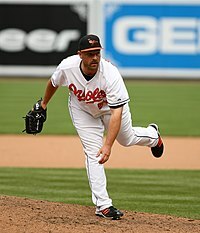 He finished third in the voting for the American League (AL) Cy Young Award, the highest a setup man has finished. That season, Rivera primarily served as a setup pitcher for closer John Wetteland, typically pitching in the seventh and eighth inning of games before Wetteland pitched in the ninth. Their effectiveness gave the Yankees a 70–3 win–loss record that season when leading after six innings. McCarver said the Yankees played "six-inning games" that year, with Rivera dominating for two innings and Wetteland closing out the victory. Illustrating the general trend, both Rivera and Rodriguez were moved to closer soon after excelling as setup men. On January 22, 2019, Rivera became the first unanimously elected baseball hall-of-famer having been inducted his first eligible year on the ballot. ^ Kay, Joe (July 13, 2015). "All Star Game could be decided by setup men". The Star. Associated Press. Retrieved October 12, 2018. ^ Jennings, Chad (July 13, 2015). "Yankees' Betances leading wave of standout setup men". The Journal News. Retrieved October 12, 2018. ^ Kilgore, Adam (July 14, 2014). "2014 MLB All-Star Game: For Nationals reliever Tyler Clippard, a perfect setup". The Washington Post. Retrieved October 13, 2018. ^ Crasnick, Jerry (June 23, 2018). "Eight under-the-radar relievers who deserve All-Star consideration". ESPN.com. Retrieved October 13, 2018. ^ Curry, Jack (October 11, 2002). "Rodriguez Is a Fantasy Player Like No Other". The New York Times. Archived from the original on October 11, 2014. ^ Johnson, Chuck (February 20, 2005). "Rodriguez set to close for Angels". USA Today. Archived from the original on October 11, 2014. ^ "1996 Awards Voting". Baseball-Reference.com. Sports Reference LLC. Retrieved January 9, 2012.